Every night I go to bed with one thing on my mind. Is tonight the night? Is she going to sleep 8 hours straight? A few weeks back (I guess I should have done a real knock and not a *virtual* one because I am now cursed) she was sleeping 5 to 7 hour stretches. For the past couple of weeks, not so much. I was only doing one night feeding and now I'm doing 2. I am transitioning her from the rocker to the crib and she's waking up more. She doesn't sleep longer than 4 hours. She's not addicted to the breast. She has slept without rocking but I do rock if she doesn't go down immediately. I really think the bed is just too uncomfortable. Is that possible? Is it just an adjustment thing? Two nights ago we had a blow out incident that put the miracle blanket out of commission. I can't find her back up velcro blanket. I have to actually use a regular old blanket. She's busting out of that and waking herself up. I'm too far in to go back to putting her in the rocker and it's becoming a tad bit unsafe. She's been making escape attempts. I don't know where she thinks she's going as she cannot crawl, walk, sit up unassisted for a long period of time, or fly. This has been a very challenging sleep week (5 days). So I ask. When? When? When will this miraculous event occur? I know every baby is different just tell me when? I need some hope and 8 hrs of uninterrupted sleep. Time to leave her with a loved one overnight. I had a friend who had another baby when her first was three (years). She said Hal wasn't sleeping through the night yet, so she might as well have another baby. Mac got up a lot as he grew older. Skinny as he was, if he was growing longer, he'd be hungry in the middle of the night, even as a toddler. I didn't have anything but my arms and his crib, and he slept in the latter most. However it was a long time before I got a full eight hours. 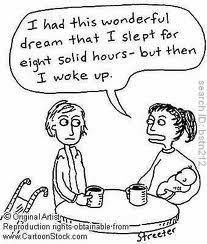 discuss are any getting 8 hrs uninterrupted with 4 month olds? Just wondering if it is happening out there in baby world. I've never heard of it from friends with kids. I wondered it alot too. I eventually surrendered and focused on retraining myself to function on less sleep cuz saheim was hopeless. I have come across the famous "sleep thru the night" baby in blogland and in my books...blah blah. i guess it's a small group.